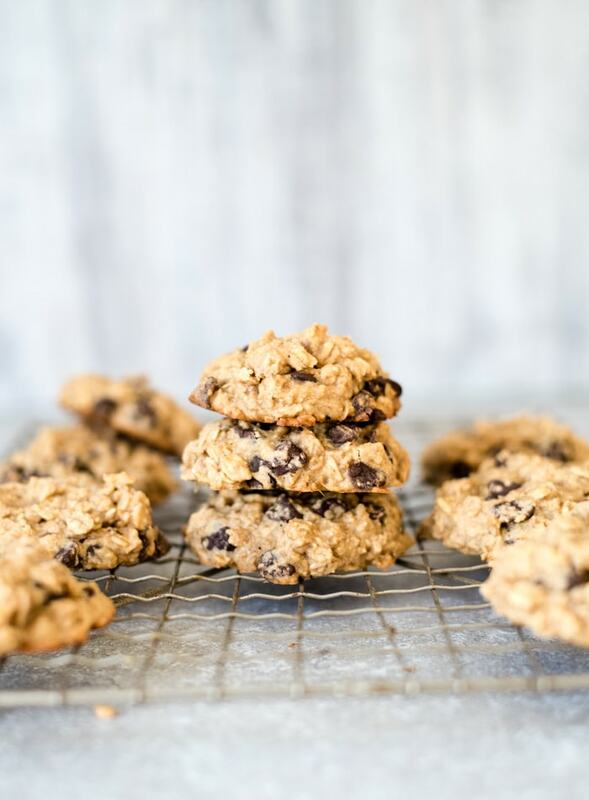 These gluten-free, vegan peanut butter oatmeal chocolate chip cookies are made with rolled oats and homemade oat flour for a simply and healthy twist on traditional peanut butter oatmeal cookies. 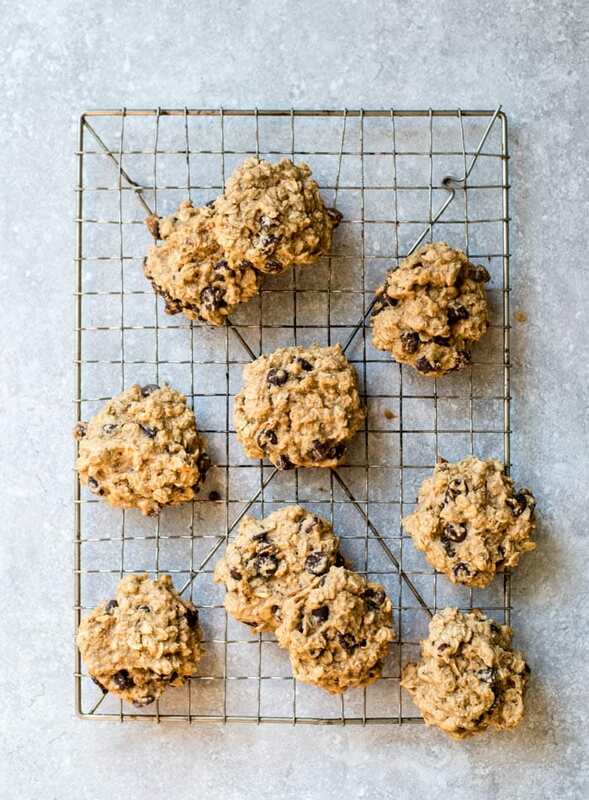 These cookies are oil-free, sweetened naturally with banana and pure maple syrup and you only need one bowl and a handful of other simple ingredients to make them. This recipe is closer to a traditional cookie than any of the above. They’ve got a really nice texture, a little crispy on the outside and nice and soft on the inside and they’re not quite as dense as the the above recipes. I really loved how the flavour and texture of these came out with the added sweetened, almond milk and oat flour. 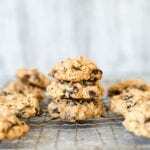 These are very similar to my Flourless Peanut Butter Banana Oatmeal Cookies which are made with just oats, banana and peanut butter but these ones are bit more a treat with the extra maple syrup. 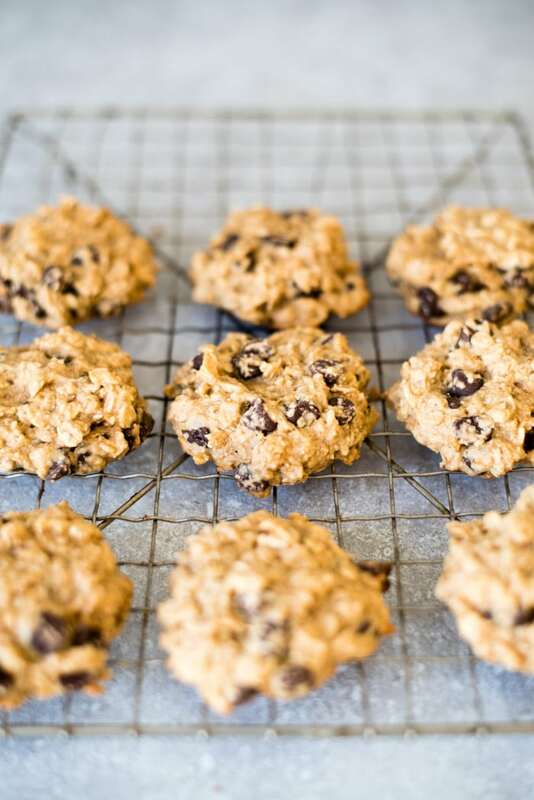 Peanut butter, oats, chocolate chips, maple syrups..ah, all the good stuff! All the stuff you’d want to find in cookies sans the butter, flour, eggs and milk. You can use any plant-based milk in these and you can use either chopped dark chocolate or dairy-free chocolate chips. I’d recommend Enjoy Life Chocolate Chips or Chocolate Morsels. They’re awesome and free from soy, gluten, wheat, dairy and other common allergens. I love them. Chopped dark chocolate is a good choice too. I like the Alter Eco Dark Chocolate Sea Salt Bars. Cacao nibs would also work if you want to go sugar-free. You can whip the cookie dough up in one bowl. The only other thing you’ll have to do is blend up some oat flour. I love the Ninja single-serve blender cups for this. Let the oats process for a while so they’re as fine as you can get them. Once you’d made the oat flour, just mix everything in a bowl, plop the dough onto baking sheets and you’re done. I love, love, love silicone baking mats for baking cookies and roasting veggies. They’re inexpensive, eliminate the need for oil and everything bakes like a dream on them. You can grab a set here. These peanut butter oatmeal cookies are made with oats and homemade oat flour making them naturally gluten-free. Use gluten-free certified oats if needed. 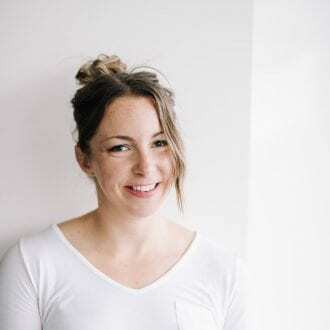 They’re also sweetened naturally with banana and pure maple syrup for a refined sugar-free treat you can feel good about enjoying. Create 14 cookies shapes and place on a parchment paper or silicone mat lined baking sheet. The dough will be a bit wet and sticky but that’s what you want. Bake for 15 minutes and let cool before before handling. These can be stored in an air-tight container at room temperature, in the fridge or they can be frozen. I would recommend storing them in the fridge if you’re not freezing them. 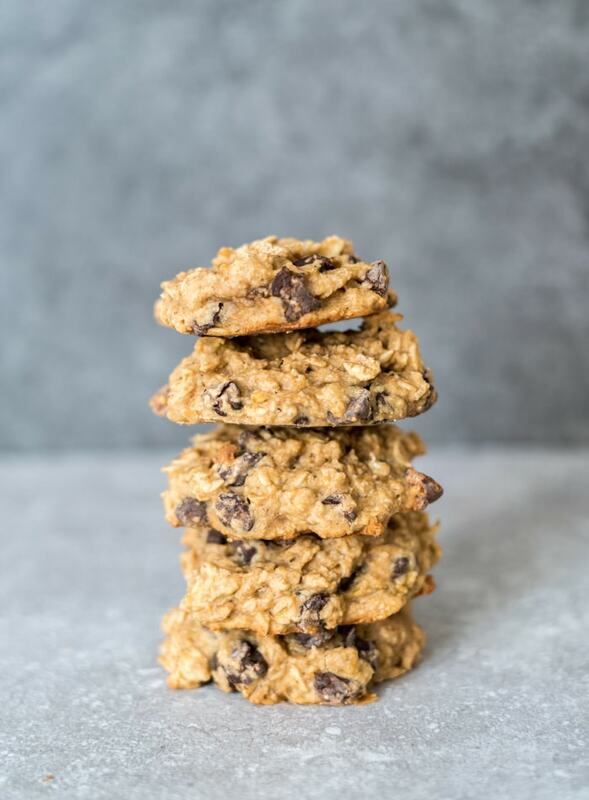 The best oat chocolate chip vegan oil-free cookies I’ve tasted! AWESOME! Thank you so much! You are so very welcome. So happy you liked them. Thanks for the comment! I have oat flour- can I just use that? How much would it be for the recipe? Thank you. I’m not exactly sure as I’ve never made these with oat flour but probably about the same amount as using oats. As long as you have a cookie dough-like consistency, it should be okay although I haven’t tested it so I can’t say exactly how they’ll come out. Thanks!